Russian warplanes were taking off one after another with roaring thunder on Wednesday from their base on Syria’s coast, which was bustling with activity as Moscow pressed its air blitz days before scheduled peace talks. Helicopter gunships were sweeping low around the base in the province of Latakia to prevent any possible attack. Even though the front line is dozens of kilometers away and the area around the base is tightly controlled, the Russian military methodically patrols the area to make sure there is no ground threat. Two heavy transport planes were parked near the main terminal as soldiers toting assault rifles stood guard. Since Russia launched its air campaign in Syria on Sept. 30, its warplanes have flown nearly 6,000 missions. The number is impressive for a compact force comprising just a few dozen warplanes. The Russian military brought a group of Moscow-based reporters to the base on Wednesday to see the operations. 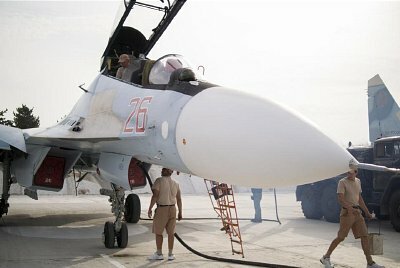 Defense Ministry spokesman Maj. Gen. Igor Konashenkov said Tuesday that over the previous four days Russian warplanes had flown 157 sorties striking 579 targets in six Syrian regions, and the pace showed no sign of letting up Wednesday. The Russian military has said it was targeting the Islamic State group and other extremists and has angrily dismissed Western accusations of hitting moderate rebels fighting Syrian President Bashar Assad. Moscow also has rejected claims that its aircraft have hit civilians, insisting all casualties have been at extremist facilities away from populated areas. Konashenko said the Syrian government forces have retaken about 250 villages and towns from extremists thanks to the Russian air campaign. He said each target is verified through multiple intelligence sources before Russian planes hit it. The Syrian government and the opposition are set to sit down for talks in Geneva, scheduled for Monday. The negotiations are meant to pave the way for a political settlement with a new constitution and elections in a year and a half, but hopes for their success are dim. 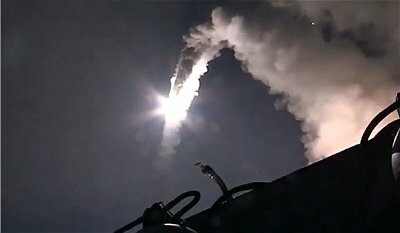 International negotiators, including the United States and its allies and Assad’s backers, Russia and Iran, have failed to reach common ground on which of the myriad Syrian militant groups should be considered extremists and fair game for strikes and which should be part of political talks. Russian Foreign Minister Sergey Lavrov and U.S. Secretary of State John Kerry were meeting in Switzerland on Wednesday to try to resolve the differences over who is eligible to join the U.N.-mediated peace talks. Meanwhile, the relentless Russian air campaign has helped the Syrian army recover and regroup after a series of failures last year and score significant battlefield gains in recent weeks. Some believe that a string of military successes would likely encourage Assad’s government to take a tough stance in the talks. The Syrian conflict, which began in early 2011 with protests against Assad’s rule, has turned into an all-out war that has killed a quarter of a million people and displaced millions in nearly five years of fighting. The most visible difference at the Hemeimeem base since The Associated Press first visited in October is the presence of state-of-the-art air defense weapons. Towering launch tubes and massive radar arrays of the long-range S-400 air defense missiles could be seen at the edge of the base. Russia deployed the powerful weapons, capable of hitting targets 400 kilometers (240 miles) away, after Turkey shot down a Russian warplane along the Syrian border on Nov. 24. Turkey said it downed the jet after it violated its airspace for a few seconds, while Russia insisted its plane had stayed within Syrian airspace. The incident was the first time in more than half a century that a NATO nation had shot down a Russian plane. 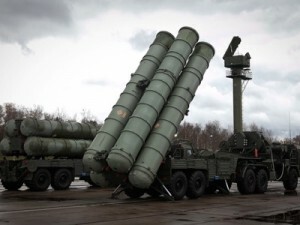 The Russian military quickly sent the S-400s to the base and warned that it would fend off any threat to its aircraft. Russia also punished Turkey by imposing an array of economic sanctions, including a ban on the sale of package tours. Relations have remained tense, and Putin in December warned Turkey against ever violating Syrian airspace. With the S-400s deployed at the Russian base, just about 50 kilometers (30 miles) south of the Syrian border, much of Turkey’s territory is within their range. To augment the air defenses, Russia has kept a navy ship carrying long-range air defense missiles off the Syrian shore. And Russian fighter jets have begun escorting strike jets on their combat missions to fend off any air threat. Russia’s military intervention in Syria has obviously rattled the West. That’s why Britain’s Defence Minister Michael Fallon says he’s “increasingly disturbed” by Russian air strikes there. That’s not because they are hitting ‘moderate opposition groups’, as he claims, but because they are striking the very militants that the West had been covertly assisting to oust President Assad. Russia’s intervention has stymied that and in doing so it has also exposed the West’s double-standards. U.S. 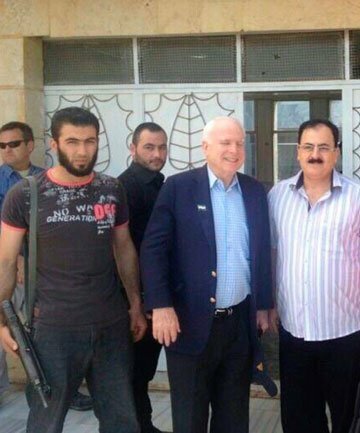 Senator John McCain has been photographed with Bakr al-Baghdadi, the leader of ISIS (otherwise known as Islamic State, ISIL or Daesh) on a number of occasions. 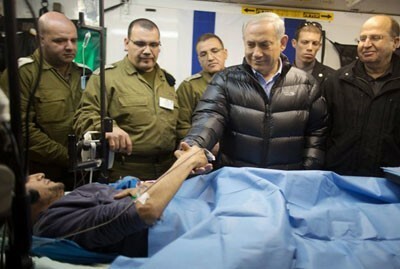 Likewise, Israel’s Netanyahu has been pictured with wounded “Syrian rebels” (actually Sunni militants) being treated in Israeli military hospitals. In fact Israeli Special Forces are routinely venturing into the Syrian war zone to evacuate the wounded for treatment in Israel. So the West’s plans to oust President Assad, by covertly supporting Sunni militants in ISIS (Islamic State, ISIL, Daesh) have been thwarted for now. Readers will also note that the above report doesn’t once refer to who is bankrolling what it euphemistically refers to as “Syrian opposition forces”. It doesn’t specify because initially at least, the opposition forces were being bankrolled by the gulf states — supposed allies of the West. Now of course ISIS is funding itself with oil from the territories it has seized in Syria and Iraq. And who is buying the oil from ISIS and thus helping to fund its operation? Turkey, another supposed ally of the West. Despite the obvious relevance the above report breathes not a word of this to readers. Even though this source of ISIS funds, the oil from captured territory in Syria and Iraq, is crucial to its finance and the prime target for Russian air strikes. As with so many Western corporate news reports, the above doesn’t contain any outright lies. It just omits to mention crucial facts; in effect making it no more than disinformation.